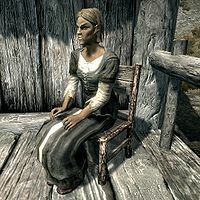 Curwe is an Altmer farmer and the wife of Vantus Loreius. She lives with him on their farm. If you alert the guards to Cicero's activities during Delayed Burial, then Cicero will kill Curwe and her husband. She wakes up every morning at 7am and starts the day with a one-hour breakfast. At 8am she heads outside and starts working the land, at times sweeping the porch. At 7pm she takes a one-hour dinner before she goes to bed early at 8pm. Curwe wears a set of green farm clothes and a pair of boots. She is equipped with an iron dagger, and carries a key to the farmhouse, as well as a selection of common items and gold. This page was last modified on 11 March 2018, at 16:47.